Thousands of disappointed and disgruntled passengers are milling about Stansted airport's departures area, unsure of where to go and what to do. The airport had been brought to its knees by more than 50 protesters who stormed the runway in the early hours of Monday morning. Many passengers were clearly distressed by their predicament and annoyed at missing important engagements, but many more were angry and shocked at what the protesters had been able to achieve. 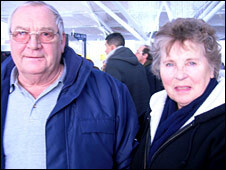 May MacDonald and Thomas Johnstone, from Ayrshire, were due to fly to Prestwick at 1200 GMT, but found themselves in "limbo". Mr Johnstone, 70, could not believe the protesters had been able to get so close to the runway. "It is ridiculous. If 50 people can do it, what's to stop terrorists. They should have an electric fence," he said. Mrs McDonald, 72, said the security breach was "frightening". "It makes me very apprehensive about flying," she added. 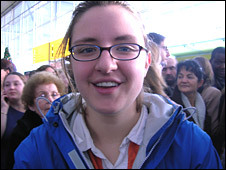 Katelan Saner from Boston has an exam in Dublin on Tuesday and is hopeful Ryanair could "squeeze" her on another flight. The 20-year-old student said the incursion by the protesters was "unbelievable". "Our airport security in the US is so tight. It just seems ridiculous you are not allowed knitting needles, razors, or even water on a flight, but people can chain themselves to a fence beside a runway," she said. 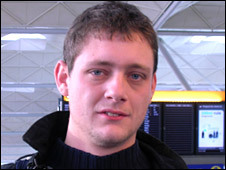 Andrew Robertson, from Norfolk, was being marshalled into one of the many queues at Stansted by police officers. The businessman, who was due to fly to Eindhoven, in the Netherlands, for a meeting, said the protesters should have been removed immediately. He said: "These people were here to cause as much disruption as they could. They needed to be frog-marched out. We have strong laws that could have been used but haven't. "This must be the only country in the world which would let an international airport close." While the airport is relatively calm and staff are doing their best to appease unhappy passengers with refreshments, there appears to be no sympathy for the protesters. Simon Harth, from Belfast, said the action of the protestors had made him bitter towards their cause. The 24-year-old engineer said: "I do what I can at home for the environment, I car-share for instance. I've read the facts and air travel accounts for just 2% of carbon emissions. "Climate change is going to affect everyone and we should be doing as much as we can, but this is not the right way to get the message across. It's made me bitter towards environmental action like this." Shirin Memarizadeh said she was devastated at the fact it was looking likely she was not going to see her sister, niece and nephew in Italy. The 27-year-old, from Manchester, said the protest had not made her think twice about flying. "I don't feel guilty about flying. It's the easiest way to get to see your family," she said. While Ellen Coiret was busy trying to keep her two young daughters entertained, her husband was queuing up to talk to a Ryanair representative about an alternative flight to Marseilles. The 37-year-old, who lives in France, said it was looking highly likely they would have to pay for another night in London. "We have jobs to go back to and children to get back home," she said. "I can understand why the protesters took action. There has to be limits to airport expansion but we are stuck in the middle. There are other, more positive ways of doing it. They have achieved nothing other than messing up our day. " 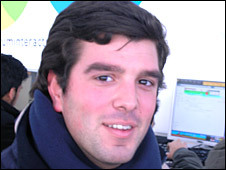 Goncalo Souto from Portugal, was searching the web for alternative flights to Puerto. The dental student, 22, and his three friends had been at the airport since 0500 GMT. He said: "I don't agree with the protesters. Because low-cost flights are good for people to travel around the world and see new things. 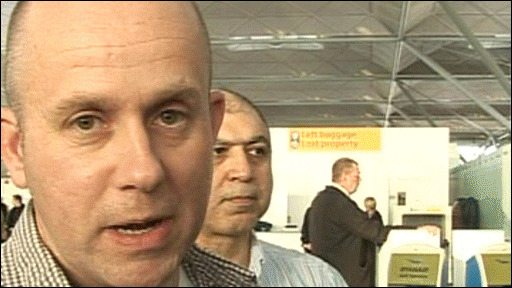 "I'm very angry, I'm blaming the protesters and also Ryanair for giving us no choice. If they had delayed the flights they could have ensured we got home at some point, they simply cancelled the flights and there's nothing we can do."